Archive Dreaming is a game changer for the experiential graphic design field—this talk at Xlab 2018 is one you won’t want to miss! 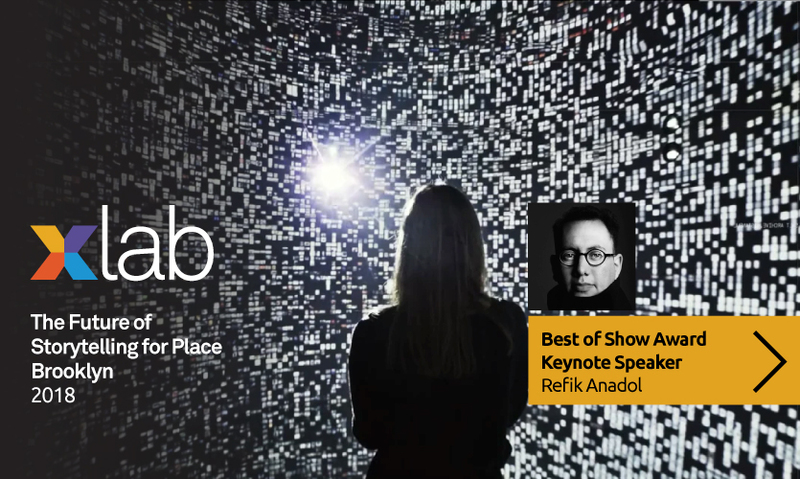 Refik Anadol is no stranger to the SEGD Global Design Awards or Xlab. The Istanbul-born, LA-based media artist and director has produced digital experience projects that received a 2016 Honor Award, a 2017 Finalist recognition and 2018 Honor and Best of Show Awards. He has received many other prestigious design awards for his groundbreaking work, including Microsoft Research’s Best Vision Awards, UCLA Art+Architecture Moss Awards, The University of California Institute for Research in the Arts Awards and CODAvideo Awards. In addition to lecturing at UCLA’s Department of Design Media Arts, Anadol has spoken at SEGD’s Xlab, DesignX and Xlporer events in 2016. Anadol’s work often combines real-time data and live audio/visual elements to create site-specific, immersive media experiences that challenge our perception of space and question the distinction between physical and digital. The participant's "state of consciousness" says Anadol, "is transformed by being surrounded in an engrossing environment. It creates a perception of being present in a non-physical world." These site-specific audio/visual performances have been seen in venues across the globe from the Walt Disney Concert Hall and the International Digital Arts Biennial Montreal, to the Ars Electronica Festival in Austria and Sydney City Art in Australia. At Xlab 2018, Raman Mustafa of Refik Anadol Studio will talk about the creation of Archive Dreaming, the SALT Research-commissioned piece that used cutting-edge machine learning and 1,700,000 documents to create a multidimensional data-driven immersive installation. Archive Dreaming transformed a gallery space into an environment that asks, “What if we imagine that 2017 is the future?” in the context of the efficiency, ecology and sustainability of a cultural institution. The space transgresses the normal boundaries of a library experience and the conventional flat cinema projection screen into a three-dimensional kinetic archive, reframing memory, history and culture for the 21st century. Archive Dreaming is a game changer for the experiential graphic design field—this talk at Xlab 2018 is one you won’t want to miss—but don’t take our word for it, see the award article and jaw-dropping video yourself. Get more informationand register now for Xlab 2018in Brooklyn, November 1–2!